The Ekcentrick Force is a clever utility tool which will immediately find a place in your forcing toolbox. This is not to be seen as a substitute for the Equivoque Force or Pateo Force. Rather the Ekcentrick Force supplements and complements those 2 forces very well. The Ekcentrick Force is extremely easy to perform and a major part of its process is fully automatic. Its simplicity is what deceives the audience. This principle is very powerful and yet very flexible and can be applied in multiple ways. 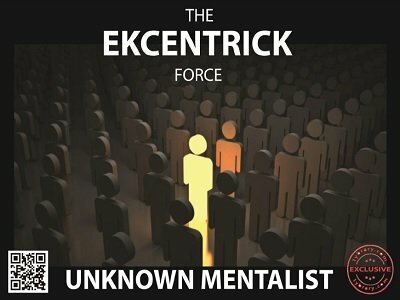 Here the Ekcentrick Force is applied to a coin mentalism routine and the result is a cool anytime anywhere type of pocket mentalism routine which is big on impact. Also included in this routine are multiple prediction options, alternate handlings and multiple theme ideas. You will not only learn a good routine but will also gain the Ekcentrick Force principle which is a powerful tool with multiple uses. This is a short and direct way to force any one of six coins or other objects by a selection/elimination process. It takes a little bit of thought and practice, but it's good and certainly much better than the artificial looking "hot rod" force which involves counting or spelling. Add it to your arsenal of forces such as equivoque, PATEO, Quinta, and psi forces. It's a worker. Because in the UK two pound coins can be found with many different back designs to the queens face side means because of those back designs been different story's are possible example 1611-2011 Two Pound Coin " King James Bible" a christian message is possible, 2015 Great Britain First World War Royal Navy Belfast £2 Two Pound Coin for a military story after all Britain's got talent was won with a war time Magic theme. So basically do not let this method/Idea slip by you. This is a nice effect for coins. I recommend this highly in conjunction with the PATEO force.